CDC’s National Center for Injury Prevention and Control (NCIPC) announces new opioid funding opportunities. 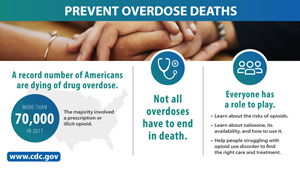 Overdose Data to Action (RFA-CE19-1904) focuses on the complex and changing nature of the opioid overdose epidemic and highlights the need for an interdisciplinary, comprehensive, and cohesive public health approach. State, territorial, county, city, and township health departments need access to complete and timely data on nonfatal and fatal drug overdoses to understand the scope and direction of the evolving overdose epidemic. These funds will help states, territories, and localities obtain high quality, more comprehensive, and timelier data needed to better inform prevention efforts. This funding opportunity will continue work focused on: increasing comprehensiveness and timeliness of surveillance data; building state and local capacity for public health programs determined to be promising based on research evidence; making Prescription Drug Monitoring Programs (PDMPs) easier to use and access; and working with health systems, insurers, and communities to improve opioid prescribing. It adds new work focused on linkages to care and other areas of innovation supported by evidence-based practice. The total funding and the number of awards is contingent upon availability of funds, and the merit and quality of the applications. State, territorial, and select county, city, or township health departments are eligible to apply. Several resources are available to assist jurisdictions including: checklists, budget one-pagers, and informational conference calls. For specific details, visit our webpage or the related documents section of the notice online at grants.gov. A pre-application teleconference call will be conducted on February 12, 2019 to address questions from eligible applicants. Questions and answers from the discussion will be shared online and included in an amended NOFO. Empower individuals to make safer choices about opioid use. The total funding and the number of awards is contingent upon availability of funds, and a sufficient number of meritorious applications. A pre-application teleconference call will be conducted on February 19, 2019 to address questions from eligible applicants. Questions and answers from the discussion will be included in an amended NOFO approximately 3 weeks after the call.